Soon it will be time for kids to head back to the classroom to pop quizzes, homework and brown bag lunches. While we can appreciate their disappointment that summer holidays have to end, perhaps it’s worth reminding our children that for their peers in the developing world, going back to school is a beautiful but often elusive dream. Crowded classrooms are the norm in Uganda, where teacher training and classroom construction has not kept pace with demand. I saw the discrepancy between children who desperately wanted to attend school and their inability to do so on my recent trip to Uganda. I snapped the photo at left outside a school in Nakabele, in Uganda’s very poor Bugiri District. Even with CFTC donor support to build and furnish new classrooms, fund teacher training and provide textbooks, uniforms and other supplies, classrooms are already beyond capacity. Enrollment has increased from about 150 students to 633, so classrooms that previously held 30 to 40 students now have up to 125 or more vying for seats. Students crowd outside the doors and windows with a hope of hearing that day’s lesson. While education is a fundamental right and a critical priority in overcoming poverty – as articulated by the UN Millennium Development Goals (MDGs) – access to education is still limited for too many children around the world. The number of teachers has not increased (the Nakabele school has just six), and budgets are being stretched to the breaking point to meet the need for nutrition and educational materials. This gap of too many students and not enough instructors was the same in every school we visited, and is common in Ethiopia, too. However, many of the world’s poorest countries – including Uganda and Ethiopia, where CFTC works – are making progress. In 1997, Uganda instituted the Universal Primary Education Program to provide free education for all children. Since then, there has been a sharp increase in school attendance, however there has been a slower government response to train additional teachers, build additional schools, classrooms and structures (such as latrines and kitchens), or provide uniforms and school materials (such as textbooks, pencils and notebooks). The result is overcrowding for the children who can get there, and the sad fact that many children still cannot afford to buy the basics needed to attend school in this impoverished country. 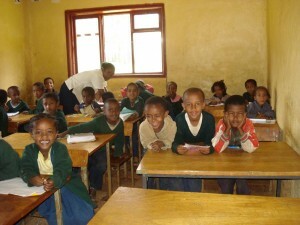 These Ethiopian school children are clearly happy to be back to school. 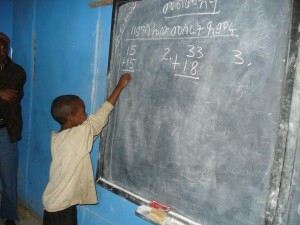 In Ethiopia, a model of Alternative Basic Education (ABE) has established alternative schools in areas that otherwise have limited or no access to education. Once seen as being a separate form of education, ABE is now recognized by the Ethiopian government as a way to reach its target of 100 per cent school enrollment by the year 2015. Yet still, barely half of all students in Ethiopia will complete primary school and up to a third of those eligible are not even enrolled. Create school gardens, which improve the variety and quality of students’ diets, once the gardens are harvested. More broadly, CFTC works closely with our local community organizations to further community understanding of the value of education, especially for girls, so that the increasing numbers of children wanting to be students have family support to enter and stay in school. All of this work, however, takes place within communities where there is still great poverty, which means that even where education is state-sponsored, families may not be able to afford mandatory uniforms or necessary school supplies. Children may be too hungry to learn effectively, or they may be kept home to work and earn a pittance of an income to help support their families. The value of education for girls is often deemed inferior to their value as a bride, and so the opportunity for girls and young women to earn an education and lift themselves and their families above poverty is often unavailable. The situation is truly desperate for child- or grandparent-headed families, who struggle to survive day-to-day in the devastating wake of HIV/AIDS in East Africa. One of the things that struck me most during my travels through Uganda (and the same is true in Ethiopia), is the integral link between quality primary education and the income-generation opportunities that last for generations. In the past several weeks, as the famine in East Africa has spread and – despite many warnings from emergency relief and international development agencies over the previous year – finally received public attention, I’ve been thinking back to the root problems that lead to such food emergencies. Ethiopia and Uganda, this time around, have not been hit as hard by the drought as they were 27 years ago. The reasons for that are multiple and complex, but it seems that one of the key differences between Ethiopia today and in 1984 is that long-term, sustainable and best practice approaches to development have gained traction. 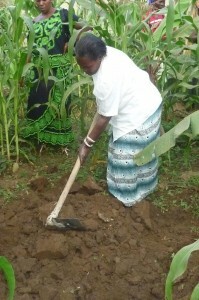 Female farmers receive training and “seed” money from HUYSLINCI, a CFTC partner organization in Uganda. Repeatedly during my stay in Uganda, I was amazed by the abundance and richness of the land around me. No one will claim that conditions are not challenging to grow food in these sub-Saharan countries that are so susceptible to drought – droughts that all acknowledge are occurring more frequently. No one will claim that the legacy of environmental degradation and ongoing climate change doesn’t still take its toll. But, the reality is that there is enough food in these countries to feed their populations. The problem is one of access, distribution and affordability – not one of scarcity. In Uganda, even though the rains were late and the season had been drier-than-average, we passed thousands of rolling green acres of tea and sugar plantations, and many small farms. Roadside fruit and vegetable stands overflowed with tomatoes, melon, avocados, mango, Jack fruit, corn and plantain. I saw income-generating agricultural projects with crop yields to feed entire communities, plus more – if the produce could be transported efficiently and if the community members could afford to purchase it. In Uganda and Ethiopia, food prices have doubled and tripled in the past year, driven largely by rising fuel costs. I remain convinced that the long-term prevention of food crises such as we are seeing in East Africa today rests on education and the sustainable, income-producing opportunities it affords. 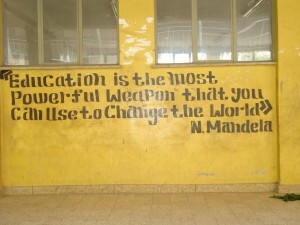 Nelson Mandela’s words inspire all who see them on this wall in a school in Addis Ababa, Ethiopia. An educated, well-trained community knows how to practice modern farming techniques and “drought-resilient” agricultural storage and marketing. Its parents and guardians have the literacy, numeracy and vocational skills to manage businesses or get jobs. They can support their children’s education, and more broadly, care for themselves and their children more effectively with better health, hygiene and nutrition information. These communities view education not as a luxury but a necessity, recognizing that educating one’s children is a long-term solution and the greatest hope of breaking the poverty cycle and creating meaningful, sustainable change. So, as September approaches, the air gets crisp and we bring in our own harvests here in Canada, welcome back to school to all – sweet words, indeed!